BLOOMINGTON, Ind. -- Dr. Rui Mari de Araújo, prime minister of the Southeast Asian nation Timor-Leste, will speak Wednesday, Sept. 28, at Indiana University Bloomington as part of the IU School of Global and International Studies' Distinguished Diplomat Speaker Series. Araújo, who became prime minister in February 2015, will discuss the work of leading a young nation and working toward its goals for sustainability and self-reliance at 4 p.m. in the Grand Foyer of the IU Auditorium, 1211 E. Seventh St. He will be introduced by IU President Michael A. McRobbie and hosted at the School of Global and International Studies by Dean Lee Feinstein. The lecture is open to the public, and a reception will follow. A physician, Araújo leads the sixth Constitutional Government of Timor-Leste, also known as East Timor, since it gained its independence in 2002. Araújo was an active member of the resistance during Indonesia's occupation of Timor-Leste. The resistance movement fought for independence for 25 years after Indonesia invaded the country to its south in 1975. The country that covers half the island of Timor is considered among Southeast Asia's most democratic, with multiple political parties and having held two presidential and legislative elections and an independence referendum, all considered free and fair by international observers. Under Araújo, Timor-Leste has worked through international law and multilateral institutions, particularly since a U.N. transition force was essential to ending the occupation. The country has appealed under the United Nations Law of the Sea to help settle its maritime boundaries with Australia -- what Araújo considers an existential issue for the country's long-term economic self-sufficiency and what the Timorese consider their "last fight of sovereignty." Araújo earned a medical degree in 1994 and after working as a doctor earned a postgraduate degree and master's degree in public health. 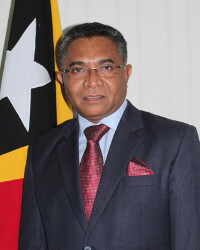 He first served the new Timor-Leste government starting in 2001 as minister of health, later becoming the deputy prime minister of social affairs. From 2007 to 2012, he was appointed to the Council of State and held a position as an advisor to the ministry of health and later as senior advisor to the ministry of finance. In his inaugural address, Araújo laid out several key themes for his government, including continued efforts at decentralizing the government, the importance of developing infrastructure, health care, access to education, alleviating poverty, and maintaining and sustaining Timor-Leste's petroleum sector. He also outlined the need for continuing positive foreign relations, particularly with Australia, Indonesia and Portugal, the country that colonized Timor-Leste for three centuries.